Member chats involve seven question and answers, from Team Profit members. We thought it would be interesting and insightful to ask existing Team Profit members what their experiences have been since starting matched betting. In a bid to help new members gain insight on what to expect from Matched Betting and Team Profit. 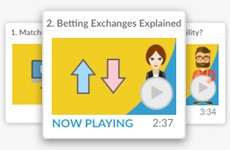 In these member chat's you will see how each member tackled learning matched betting, how they've been finding the profits and what they're spending their extra money on (amongst other things).